First and foremost, a massive well done to my friends Emma, Nick and Alessa who completed the London Marathon on Sunday. I attended, but didn’t race, but it did make me feel like doing another race before I go back to Honduras. I hate data-entry. If there was any way to break someone’s spirit, this is it. Thank God it’s for three months only. Here is the main reason I am writing this post. In the last few weeks the sister of one of the victims of the Birmingham pub bombings, Julie Hambleton, has set up a petition for the British Government to re-open the case that happened on 21 November 1974 in Tavern In The Town and the Mulberry Bush and killed 21 people. Six Irishmen, Paddy Hill, Hugh Callaghan, Billy Power, Johnny Walker, Richard McIlkenny and Gerry Hunterwere then rounded up and wrongly accused of the bombings, which consequently left them spending 16 years in prison – one of the biggest and infamous miscarriages of justice in the British history. Since then, nobody has been blamed for the bombs. The IRA have never come forward and the police have dropped the case. How would you feel if that were to happen to your brother or sister? That their killers are not brought to justice? Nearly 40 years! Paddy Hill, a sixth of the Birmingham Six has signed the petition, and quoted in the Sunday Mercury that he believes that the IRA and the British Government know who the murderers are but seem reluctant to follow-up the case. See the news article: http://www.sundaymercury.net/news/midlands-news/2012/04/22/birmingham-six-paddy-hill-signs-petition-for-re-opening-of-pub-bombing-case-66331-30810176/. To reopen the case in parliament, a case needs 100,000 names on a petition. At the moment, it is very much short of that. It needs more coverage because at the moment it seems to be mainly Birmingham based. I will leave you a link to the e-petition and a blog about the campaign. I have signed it. I hope you do too. I have just finished my first day temping, which has just been reading really, and had an interview at ICAP, which I think went well. Now I’ve got lots of nervous energy to burn off and an adrenaline that’s pumping to my head with the help of a pint of cider that cost me four quid at The Old Joint Stock. (I also had one yesterday called Thatcher. It wasn’t very good. Awful in fact. Maybe it’s something in the name. That’s what my dad said. He likes socialism. Maggie Thatcher doesn’t). 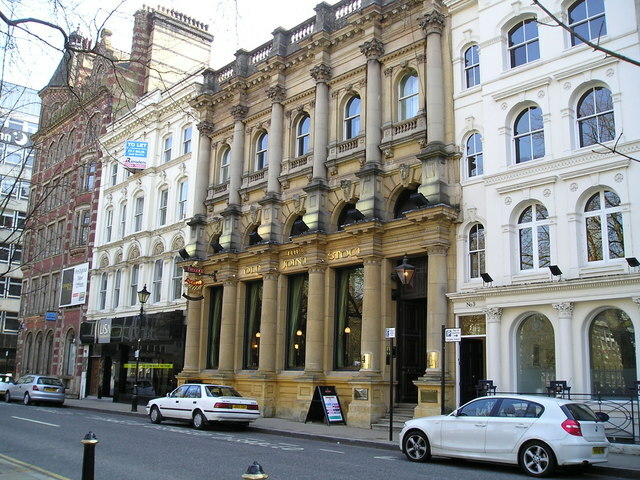 The above picture is the Old Joint Stock. Most brummies know it. It’s brilliant inside. Anyone from outside Birmingham should go there. It has a theatre and used to be a bank. Anyway, to burn off some of this energy, I thought I would write a poem about my love of cider and share it with you all. I apologise in advance. It’s going to be shite. It’s like walking on a Somerset hill. It’s like I’m in an apple orchard, near a countryside mill. I’ll keep drinking ’til I’m on my back. I’ll keep drinking this alcoholic apple Tango that’ll make me go green. ‘Cos the lack of vitamin c in it is truely quite frightening. ‘Cos I love cider, I do. I will now include a song called Transmetropolitan by the Pogues which is about some intoxicated young gentlemen going on a rampage in London. It’s a hedonistic little number that I quite like. It contains the word cider in it. I hope that you’re all enjoying your easter and shoving lots of chocolate in your mouths, a long with hot crossed buns. It seems almost certain that I will have a job this week doing temping work – data entry. It’s better than the dole queue and it’s a step in the right direction. I also have an interview with ICAP, an organisation that works with Irish migrants in Birmingham and London. All looking good. Finally. I am currently reading a book which, in its own way, has connections to do with my work in Honduras with some of the street kids who were linked to gangs. 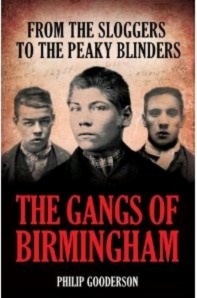 The Gangs of Birmingham (from the sloggers to the peaky blinders) by Philip Gooderson. It’s about Birmingham’s gangs in 19th century during Victorian times and the street kids living in poverty. Many of the case studies remind me of the street kids in Casa Alianza, being abandoned and turning to the gangs as a way of protection. Some things just don’t change, do they? It’s a fascinating read for brummies. There are similar books for Liverpool, Manchester and London, if that is where you are from. It’s extremely insightful. I’d no idea that Birmingham had deep religious segregation between Catholic Irish and Protestant English, leading to mass riots (the Murphy Riots). I recommend it. I picked it up for 3 quid at HMV if you’re interested. Otherwise, here is a link. The cover looks a bit grizzly, but don’t let put you off. http://www.amazon.co.uk/Gangs-Birmingham-The-Philip-Gooderson/dp/1903854881/ref=sr_1_1?ie=UTF8&qid=1333924815&sr=8-1.